Veterans of Routt County, CO. The Elite Survival Axe is an American Made multi-tool that provides 30 different tools most frequently needed for rescue and survival. The design incorporates an all-steel head and tang of 1055 carbon steel combined with an ergonomic lightweight glass filled nylon handle designed to provide a much better grip and balance while using this powerful American Made multi tool. The heat treated re-sharpenable Hatchet edge is great for chopping, clearing unwanted debris and prying. The hammer head and claw provide you with the ability to breach walls, remove and hammer nails . The integrated 6” saw blade folds out from the handle and will cut thru just about anything, including windshields, metal and wood. The saw blade is easily replaceable allowing you to switch out the blade for any situation. The hatchet head has an entire set of features built into it: eleven hex sockets of 9/16”, 15mm, 1/2”, 13mm, 3/8”, 7/16”, 10mm and 11 mm. The axe head also contains a back ¼” hex socket for any ¼” bit. A gas valve shut off wrench with built in bottle opener as well as a pry bar and nail puller are incorporated into the axe head. The head also has demolition grip teeth and a spanner wrench for hose couplings. The ergonomic glass filled nylon handle has its own set of amazing features. The base of the handle contains a Seat Belt Cutter with safety blade and a hardened steel glass breaker for breaking vehicle side windows. Upper and lower finger guards are provided to protect your hand when breaking glass. The Elite Survival Axe is compact and light weight at only 11.7 inches long and weighing in at only 1.5 lbs. Its large enough to do serious work, light enough to carry in a pocket or on your belt, and small enough to fit in any vehicle. For those who desire the protection of a sheath, there are two options available either an included nylon sheath or an optional leather sheath. Both are designed for belt, or rescue bag carry. 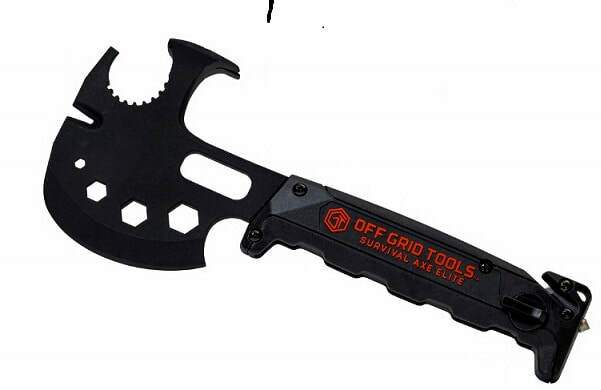 The Survival Axe is a must have tool for rescue or carried for personal survival. The Survival Axe is also an aircraft "crash axe". The Survival Axe is now the standard cutting tool supplied with the RS-4, RS-5 and RS-6 Aircraft Rescue Sets and the RS-10 Extricator set. Shipping Weight 2.4 lbs, Ships via FedEx Ground ®. Copyright © 2017 Special Service and Supply, Inc. All rights reserved.